Do you like grilled chicken? Do you want to make it more delicious? If the answer is yes, this article is for you. There are many ways to make chicken and even more ways to make it more juicy and delicious. This is why we wrote the tips and tricks to make your grilled chicken more delicious. People mostly prefer grilling chicken breasts. However, opting for chicken wings and legs also yields great flavor results. Generally, it would be great to stick with the meat that doesn’t have bones. As long as you stick with the boneless, and not too large chicken cut, you will not spend too much time making it, while the larger pieces of meat mostly take longer to cook. Not many people prefer to pound the meat. This is something that is a practice on beef or pork because they belong to the harder meat cuts. However, there are many benefits of pounding the chicken meat as well. Not only it makes the meat juicier, but it also makes it thinner, and more even. When you are dealing with the thicker piece of meat, it will take longer to cook, and it will lose its’ initial taste that it has. If you want to spend less time cooking because you have guests, or some other reason, pounding the meat for a couple of minutes is a great idea to cook it more even. Marinating is perfect for making the chicken richer in flavor. Furthermore, the chicken will be much juicer, and you wish to cook it even longer. To make it really take an effect, leave the marinated chicken in the refrigerator overnight, before you decide to grill it. This way the chicken will absorb the marinating taste, and be much more delicious after its’ grilling. Additionally, to make the chicken richer in flavor, and delightful to eat, it is more recommended to use the natural flavors that come from the fruits, such as lemon, orange, olive oil, and much more. Try to avoid the fat oils and focus on the juice from the fruits. There are many fruits and vegetables that you can add to your grilling adventure. To make your chicken taste fresher, juicier, and more delightful you can use various spices, orange and lemon peels, peppers, and various herbs such as rosemary and the rocket herb. Chicken is extremely versatile. As such, many countries use it for making their national dishes. A rare number of the country doesn’t sport a national dish that doesn’t involve chicken in it. By adding more ingredients to the marinated juice for the chicken, we can make our grilled chicken full of different international accents. There are many things that you can add to a rub, marinade, or brine (in case that you are cooking the chicken). If you want to make it taste spicier you can add garlic, pepper, and much more. If you want it to have Mediterranean taste, you can add garlic, oregano, basil, and other spices that are significant for that area. On the other side, if you want it to taste more like Asia, you can make it with coriander, Soy sauce, coconut milk. If you are a fan of the Mexican food, there are a lot of spices to choose from, such as chili peppers, chili powder, sage, and other. It is up to your personal preference. Chicken belongs to the group of soft meat, which is why it doesn’t take too long to cook. On the other hand, beef, pork, and veal are more complex meat, which is why it takes more time to grill or cook or roast them, and with that, they require high temperature. 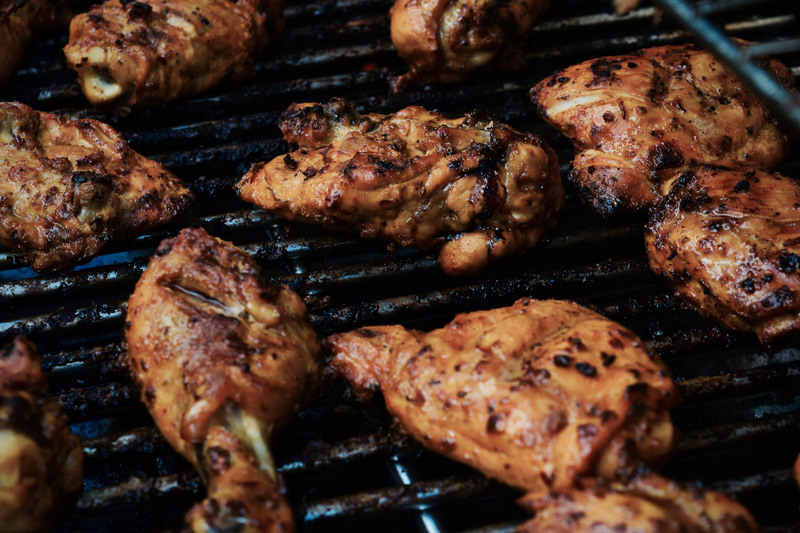 The chicken meat is grilled within 30 minutes, which is why you don’t have to force extremely high temperatures. The best way to be sure your meat is at the right temperature is to use a BBQ Thermometer Probe. A probe will allow you to check the internal temperature of the meat to ensure it is cooking correctly and will be safe it eat. Chicken meat is one of the healthiest meats. Aside from being protein-rich, low-fat, and extremely delicious, it doesn’t require the superb level of cooking to make it. What techniques do you apply to make meat more delicious? Let us know in the comments.